Well, we’re nearly mid-summer here in the great state of Texas, the sun is shining, and IBMers are hard at work planning for the forthcoming Smarter Commerce Summit to be held down in Orlando, Florida, September 5-7. This event is the third in a series of Smarter Commerce events we’ve held the last year. First, there was San Diego…then there was Madrid in May (You can read some of the coverage of that event here). But this will be no Mickey Mouse expedition. 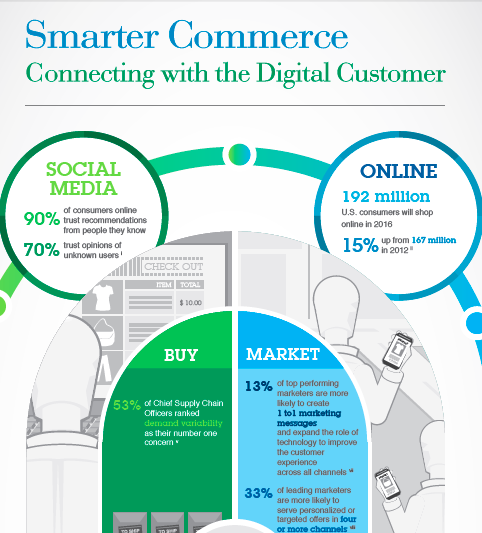 The IBM Smarter Commerce Summit in Orlando will provide business execs and practitioners with the insight and resources they need to more effectively connect with their customers. Orlando’s event will bring together over 150 business and practitioner breakout sessions comprised of everything from new technology to best practices to industry perspectives and yes, even some visionary thinking from the likes of tech guru Guy Kawasaki, who will be keynoting there. But there’s another aspect of the Smarter Commerce Summit that makes it such a one-of-a-kind event: You get to hear directly from our customers. 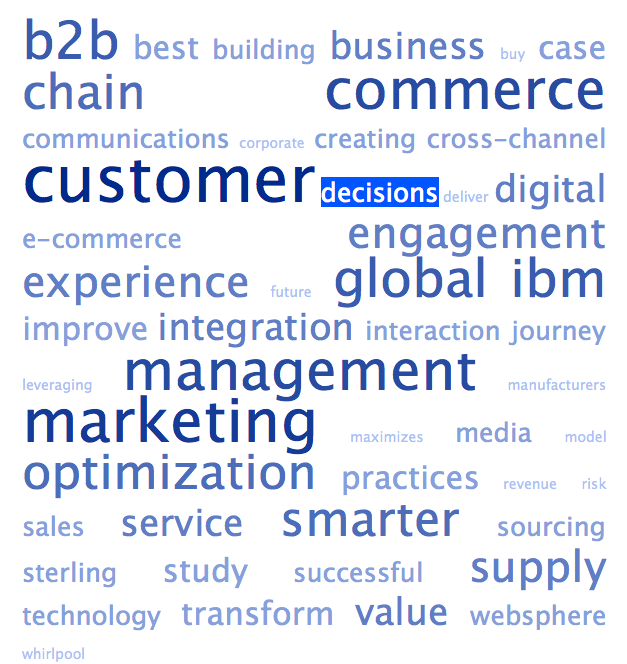 The larger words are more dominant in terms of their use, so you can judge by the cloud there’s going to be mucho focus on IBM customers, as well as topics focusing on “marketing,” “Mmanagement”, “commerce,” “global,” “integration,” and much more. You can also find broader access to the Session Preview Tool to get a glimpse of all the currently-scheduled sessions. You can also start following the #ibmscgs Twitter hashtag to keep up with key announcements and information leading up and throughout the course of the event. For you regular readers of this blog, you know I attended and blogged the IBM Global SmartCamp Finals in San Francisco week before last…wow, has it already been two weeks? In fact, it was two weeks ago today that Profitero was announced as this year’s winner. Although as I mention in the videocast with Scott Laningham below — in which we talk for about 15 minutes about what I saw, heard, and witnessed at the SmartCamp finals — all the participants, as well as those of we IBM bystanders, were winners when it came to hearing some of these groundbreaking business plans for helping build smarter (and more data-driven) cities around the globe. I also enjoyed meeting my blogging counterpart, Steve Hamm, who provided extensive coverage on IBM’s Smarter Planet blog and with whom I broke bread…err, noodles…somewhere in Chinatown. I couldn’t find my way back to that noodle shop if I had to — I’m not sure if Steve could, either.